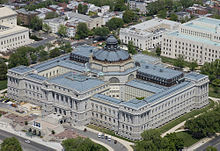 The collections of the Library of Congress include more than 32 million catalogued books and other print materials in 470 languages; more than 61 million manuscripts; the largest rare book collection in North America, including the rough draft of the Declaration of Independence, a Gutenberg Bible (originating from the St. Blaise Abbey, Black Forest) (one of only three perfect vellum copies known to exist); over 1 million U.S. government publications; 1 million issues of world newspapers spanning the past three centuries; 33,000 bound newspaper volumes; 500,000 microfilm reels; over 6,000 titles in all, totaling more than 120,000 issues comic book titles; films; 5.3 million maps; 6 million works of sheet music; 3 million sound recordings; more than 14.7 million prints and photographic images including fine and popular art pieces and architectural drawings; the Betts Stradivarius; and the Cassavetti Stradivarius. ^ a b c d e "Fascinating Facts". Library of Congress. Retrieved April 25, 2018. ^ a b "2017 Annual Report of the Librarian of Congress" (PDF). Library of Congress. Retrieved November 27, 2018. ^ "Library of Congress". Encyclopedia Britannica. Retrieved September 3, 2017. ^ a b c "Fascinating Facts - Statistics". The Library of Congress. Retrieved February 16, 2017. ^ "Thomas Jefferson's personal library, at LibraryThing, based on scholarship". LibraryThing. Retrieved November 4, 2012. ^ Fineberg, Gail (June 2007). "Thomas Jefferson's Library". The Gazette. Library of Congress. 67 (6). Retrieved January 4, 2015. ^ Interior Library. "History of the Interior Library". U.S. Department for the Interior. Retrieved April 30, 2018. ^ Library of Congress. "Annual Report of the Librarian of Congress 1866" (PDF). U.S. Copyright Office. Retrieved April 30, 2018. ^ Gwinn, Nancy. "History". Smithsonian Libraries. Retrieved April 30, 2018. ^ a b c d Library of Congress. "John G Stephenson". John G Stephenson - Previous Librarians of Congress. Retrieved April 30, 2018. ^ a b c "Key Milestones of James H. Billington's Tenure | News Releases - Library of Congress". Loc.gov. Retrieved September 22, 2015. ^ "American Memory from the Library of Congress - Home Page". Memory.loc.gov. Retrieved September 22, 2015. ^ "Congress.gov | Library of Congress". www.congress.gov. Retrieved September 22, 2015. ^ "2015 Book Festival | National Book Festival - Library of Congress". Loc.gov. Retrieved September 22, 2015. 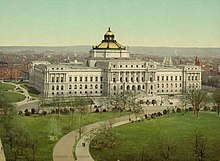 ^ "The John W. Kluge Center - Library of Congress". Loc.gov. Retrieved September 22, 2015. ^ "Veterans History Project (Library of Congress)". Loc.gov. Retrieved September 22, 2015. ^ "Inside the Nuclear Bunker Where America Preserves Its Movie History". Retrieved September 22, 2015. ^ "Gershwin Prize". Retrieved September 22, 2015. ^ "Fiction Prize". Retrieved September 22, 2015. ^ a b "Background - World Digital Library". www.wdl.org. Retrieved September 22, 2015. ^ "National Jukebox LOC.gov". Loc.gov. Retrieved September 22, 2015. ^ "NLS Home". Loc.gov. Retrieved September 22, 2015. ^ "Thomas Jefferson's Library | Exhibitions - Library of Congress". loc.gov. Retrieved September 22, 2015. ^ "All Exhibitions - Exhibitions (Library of Congress)". Loc.gov. Retrieved September 22, 2015. ^ "2015 Junior Fellows Summer Intern Program Home (Library of Congress)". Loc.gov. Retrieved September 22, 2015. 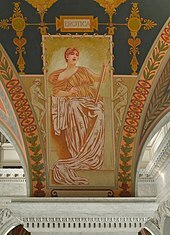 ^ "Gateway to Knowledge - Educational Resources - Library of Congress". Loc.gov. Retrieved September 22, 2015. ^ Grier, Peter (April 16, 2010). "Twitter hits Library of Congress: Would Founding Fathers tweet?". Christian Science Monitor. Retrieved January 4, 2015. ^ "America's Next 'Minister of Culture': Don't Politicize the Appointment". Retrieved September 22, 2015. ^ "Librarians-in-Residence -". The Library of Congress. Retrieved November 7, 2017. 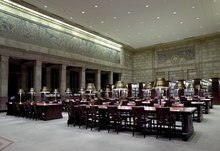 ^ "Rare Book and Special Collections Reading Room (Library of Congress)". Loc.gov. Retrieved May 5, 2017. ^ "Octavo Editions: Gutenberg Bible". octavo.com. Archived from the original on November 27, 2004. ^ "Europe (Library of Congress Rare Books and Special Collections: An Illustrated Guide)". Loc.gov. Retrieved May 5, 2017. ^ Lyman, Peter; Varian, Hal R. (October 18, 2000). "How Much Information?" (PDF). Retrieved October 14, 2013. ^ a b Chayka, Kyle (July 14, 2016). "The Library of Last Resort". n+1 Magazine. Retrieved July 19, 2016. ^ "About Us". Snapshots of the Past. Retrieved April 26, 2016. ^ Cole, John (2008). "The Thomas Jefferson Building". On These Walls: Inscriptions and Quotations in the Buildings of the Library of Congress. Scala Arts Publishers Inc. ISBN 978-1857595451. Retrieved April 23, 2018. ^ Cole, John (2008). "The John Adams Building". On These Walls: Inscriptions and Quotations in the Buildings of the Library of Congress. Scala Arts Publishers Inc. ISBN 978-1857595451. Retrieved April 23, 2018. ^ Cole, John (2008). "The James Madison Memorial Building". On These Walls: Inscriptions and Quotations in the Buildings of the Library of Congress. Scala Arts Publishers Inc. ISBN 978-1857595451. Retrieved April 23, 2018. ^ "Mary Pickford Theater Film Schedule". Moving Image Research Center. Library of Congress. Retrieved April 23, 2018. ^ "The Packard Campus - A/V Conservation (Library of Congress)". Loc.gov. Retrieved May 5, 2017. ^ "Library of Congress events listing". Loc.gov. Retrieved November 4, 2012. ^ "Subpage Title (Interlibrary Loan, Library of Congress)". Loc.gov. July 14, 2010. Retrieved November 4, 2012. ^ "Standards at the Library of Congress". Loc.gov. Retrieved May 5, 2017. This page was last edited on 23 April 2019, at 05:44 (UTC).